That the Intrepid Junior Blogger is interested in politics comes as no surprise to me, as she has always been interested in how the world works. Her interest has sharpened as she has grown, and she has some pet topics about which she can expound for hours (don't get her started on the robocall scandal as she probably knows more about that one than the people involved in it). It seems so routine to have my own teenage political analyst disguised as a typical teen in a Doctor Who T-shirt in the house that I don't consider it exceptional, which is why I was so surprised when someone contacted me to ask if they could nominate the IJB as an "Everyday Political Citizen". They are the emerging young leaders who spend their time advocating on important issues, they are the tireless seniors who volunteer their evenings in political offices and they are the parents who have never taken political action before but jump into the fray to make sure there is a crossing guard at a busy intersection. Now, what makes the IJB's nomination even more special in my eyes is that she was nominated by one of last year's finalists in the project, a local educator named Sam Livingstone who has been working with her students to increase their level of political engagement and awareness - a topic the IJB happens to be passionate about as she sees a lot of apathy about politics in the students around her. The IJB doesn't understand this, coming from a family that has always been interested in politics and where it has always been a topic of regular discussion, but as she grows older she is seeing how it spreads and it concerns her deeply. That Sam Livingstone, a true hero in our education system, saw fit to nominate the IJB is an honour indeed. Now, the IJB has some pretty staunch political views. She is quite pragmatic, though, on occasion telling me I am far too idealistic (!) and she gauges politicians by how they interact with someone her age. She has told me that you can always tell which ones only care about the votes because of the way they treat someone of non-voting age, which is likely why she was impressed with Justin Trudeau when he spoke to her as someone interested in politics and not as an adult to a child. She felt the same way about Jim Prentice when he visited Fort McMurray, impressed that he took the time at an event we were attending to speak not only to the adults (and voters) present but to the young adults and children. And I will never forget how she met one politician a couple of years ago and when she went to speak to him about youth political engagement she came back with a sour expression. "He didn't even ask me anything. He gave me a sucker," she said. "He basically thinks I'm a kid and he gave me a sucker," she repeated, making it clear that while she was now in possession of a sucker she certainly wasn't one when it came to politicians. The IJB has been pretty clear about her career path, and she seems quite dead set on studying engineering physics with an eye to working on the aerospace program. I suspect, though, that she will pursue political involvement, particularly since she has noted a dearth of elected officials with backgrounds in science. I also suspect that she will remain a political creature, working on campaigns and continuing to find the entire world of politics a fascinating place. I also know this. 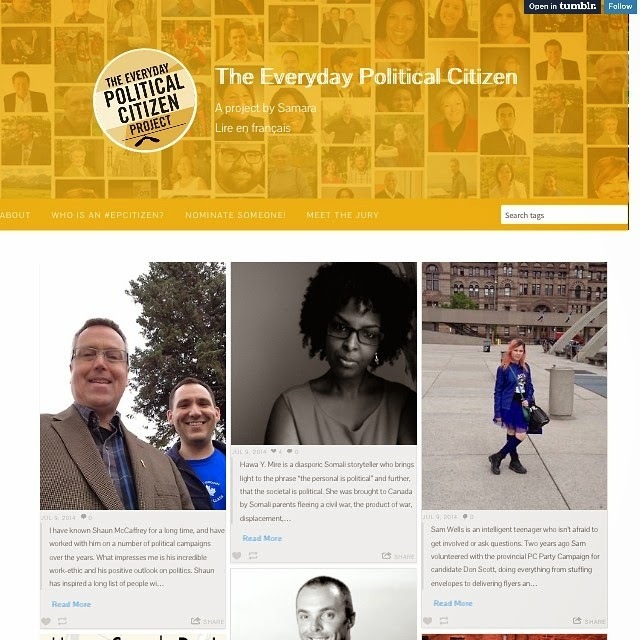 Seeing her on the front page of a website featuring every day political citizens was something that touched me deeply. We all think our kids are special, and each and every one of them is - but when someone else recognizes that our kids have done something special or are worthy of noticing I must admit the parental pride is pretty powerful. I am proud of Sam Livingstone, an educator in our school system who is teaching kids that being politically engaged is not only important but fun. And I am proud of my own Sam, who is my daughter, who is bright and mischievous and funny and occasionally difficult, and who is very much an every day political citizen.